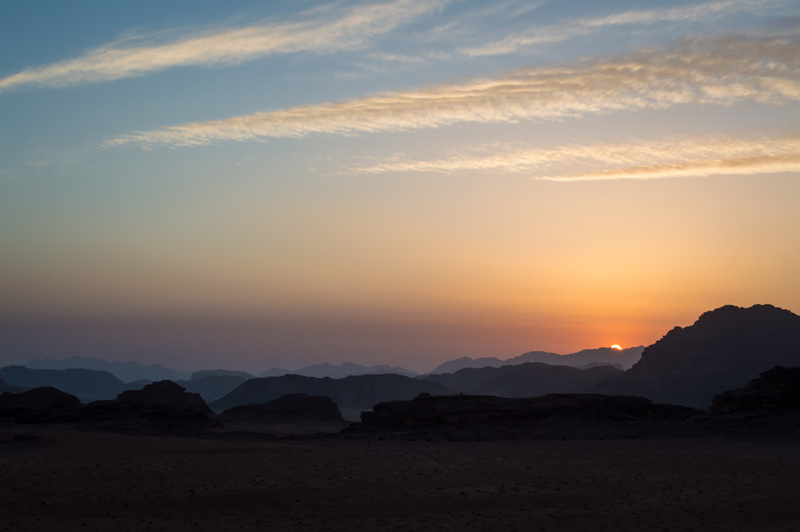 If you’ve ever seen _Lawrence of Arabia_ then you know all about the incredible beauty that can be found in the deserts of the Arab world. 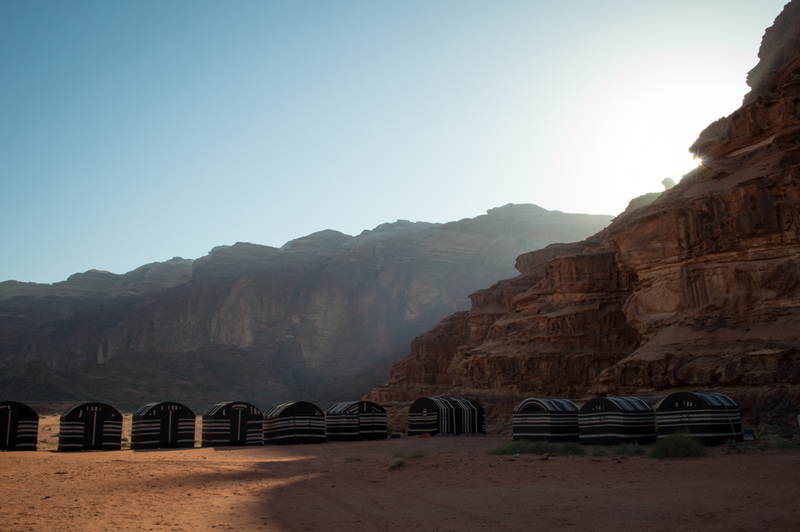 One such beautiful place, Wadi Rum, was the location for most of the filming of the movie, and this weekend I got to hike and camp out in that very place. 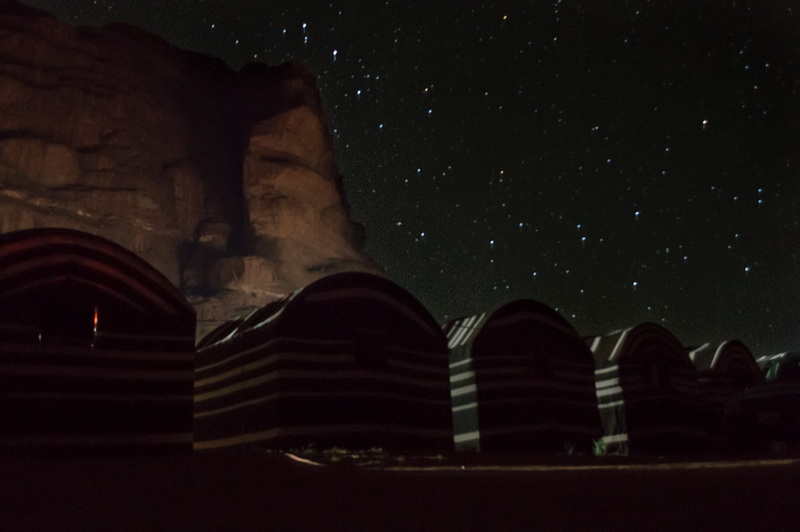 We were told about the chance to go to Wadi Rum while we were still in the States, preparing for our trip, and of course I could not possibly pass up the chance of something like that. It did cost some extra money for our guide and accommodations, but it was worth every penny. 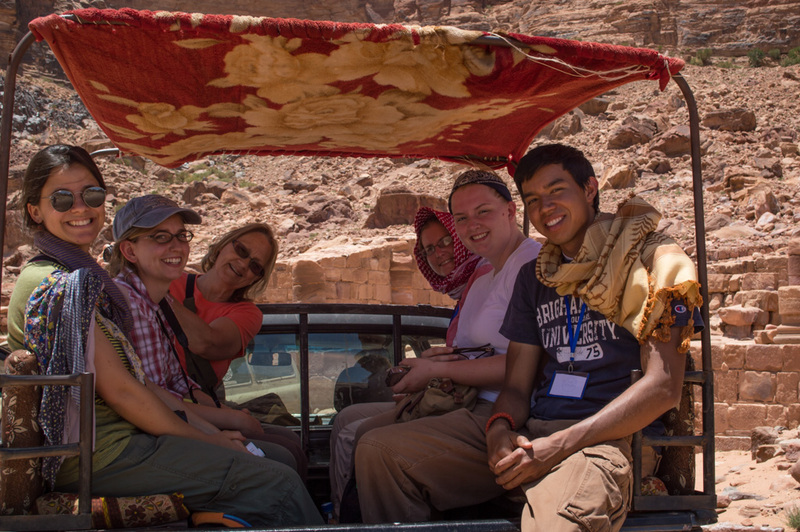 Only a handful of us from the group chose to go on this adventure while the rest stayed at Umm Sayhoon. 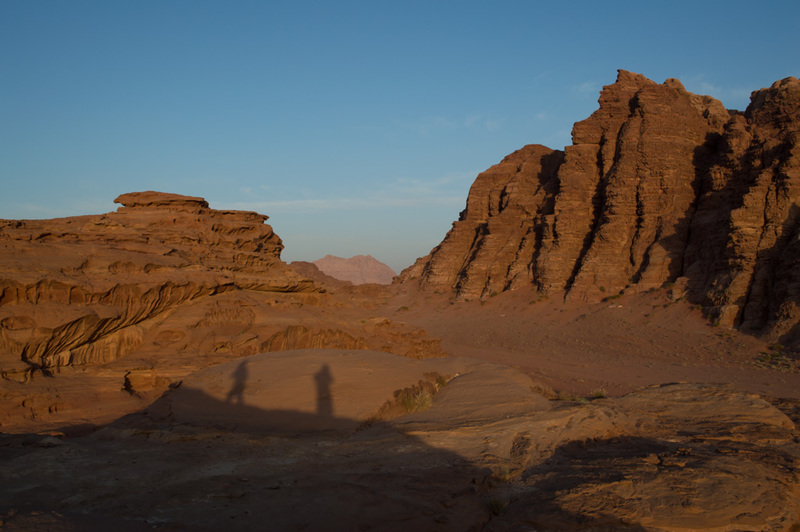 Wadi Rum is the largest valley in Jordan. 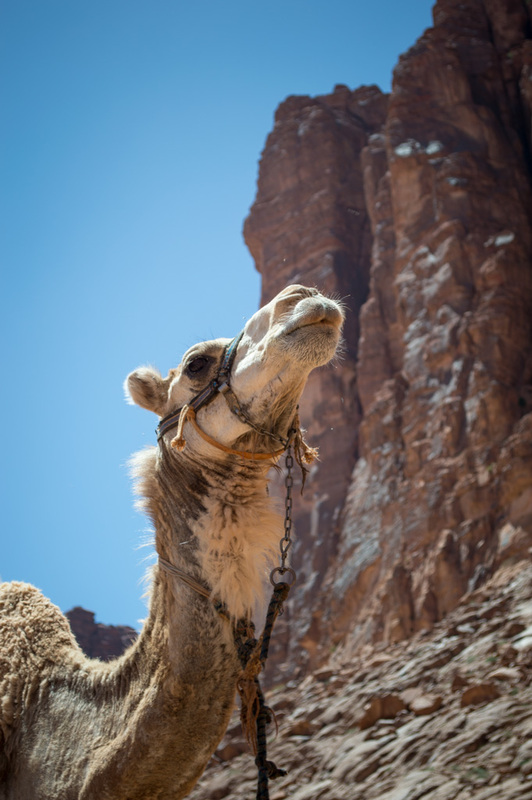 It lies east of Aqaba and is now primarily a tourist destination for backpackers, rock climbers, and travelers from all over the world. 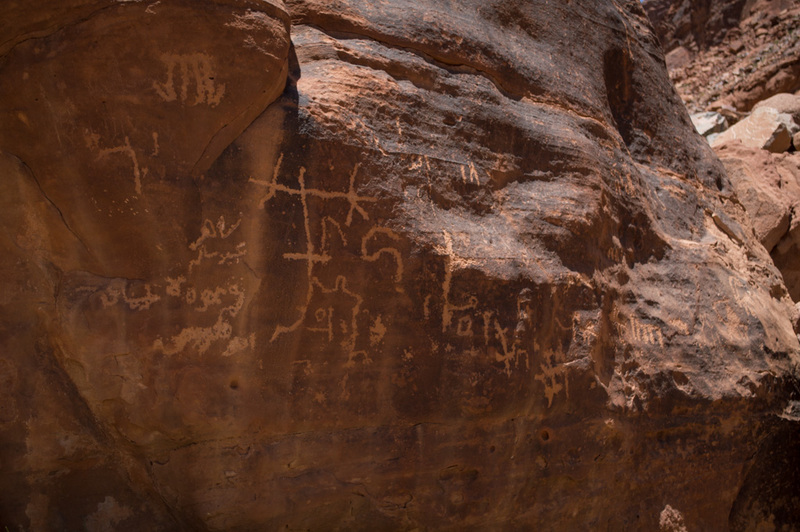 There is prehistoric graffiti in many of the rocks, serving as evidence of the ancient inhabitants of the land, as well as Thamudic inscriptions (an Old North Arabian dialect of the region), and some Nabataean inscriptions. 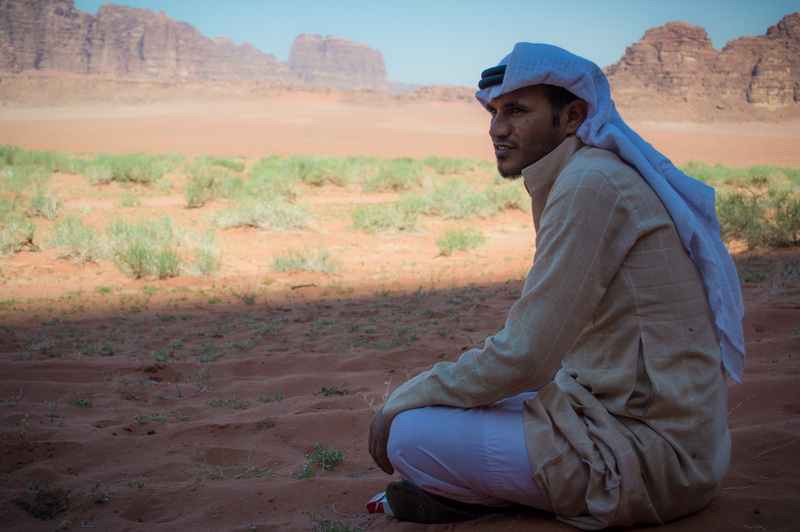 The Nabataeans also left their mark with a beautiful temple, the remains of which can still be seen today. 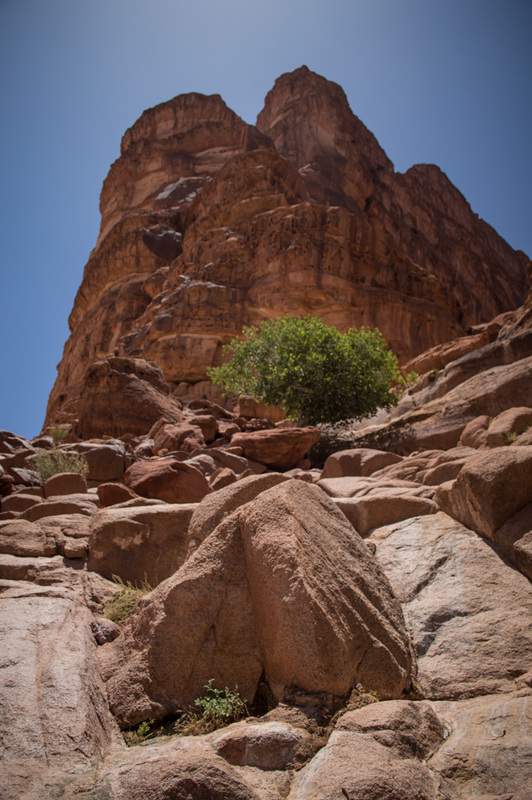 One of the many inscription-filled rocks in the wadi. 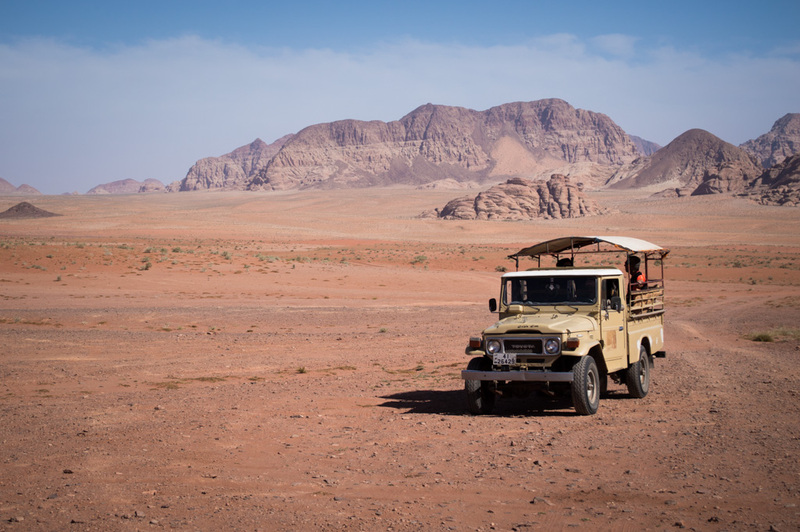 The area is still mostly known for T. E. Lawrence’s part in the Arabian Revolt against the Turks. 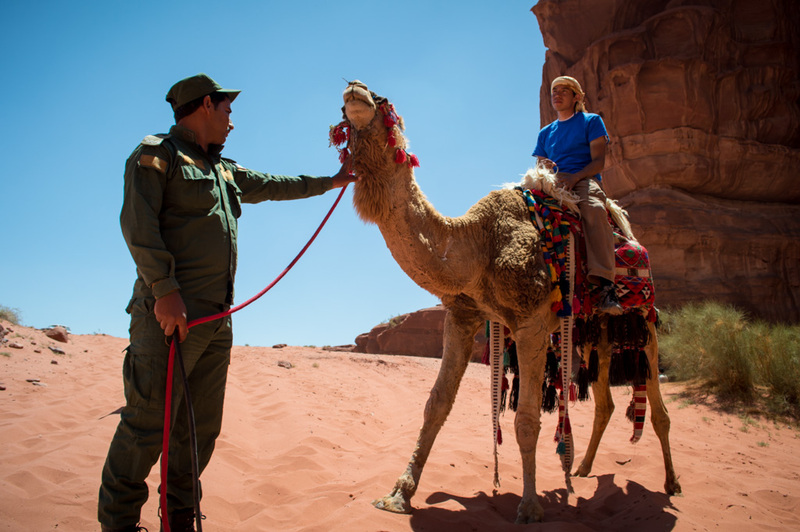 The capture of Aqaba—the first of Lawrence’s victories and the one that won him initial fame and trust—was staged and led from Wadi Rum. 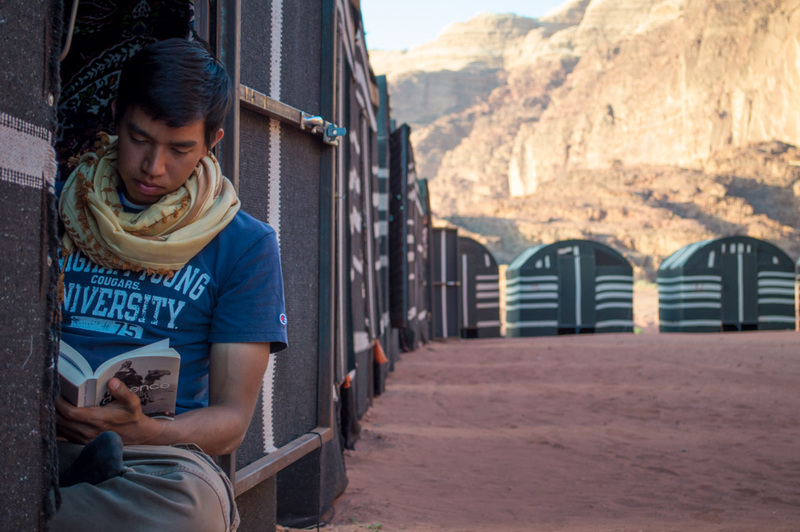 Some of the sites in the wadi have been named after Lawrence or his book, Seven Pillars of Wisdom. The two-hour drive down from Petra on the ancient King’s Highway was a little rough because of all the wavy roads, but we made it in one piece and enjoyed some fantastic views on the way. 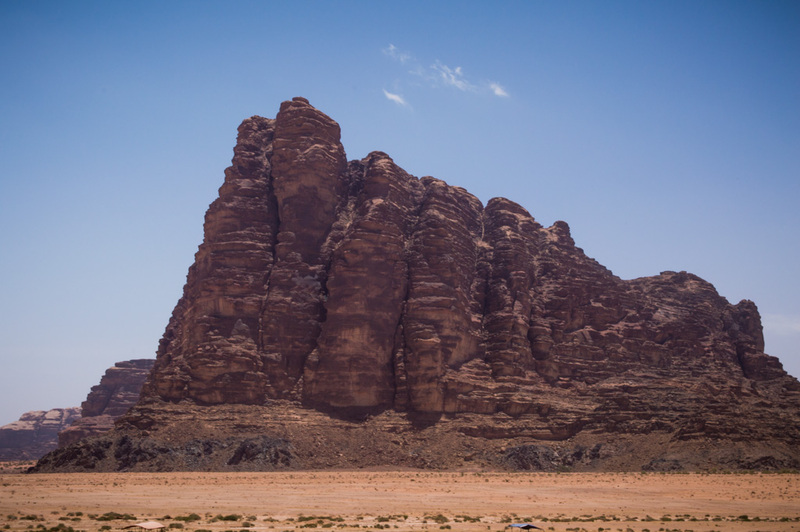 The very first part of Wadi Rum that we saw at the entrance was the famous “Seven Pillars of Wisdom” rock, named after T. E. Lawrence’s book. 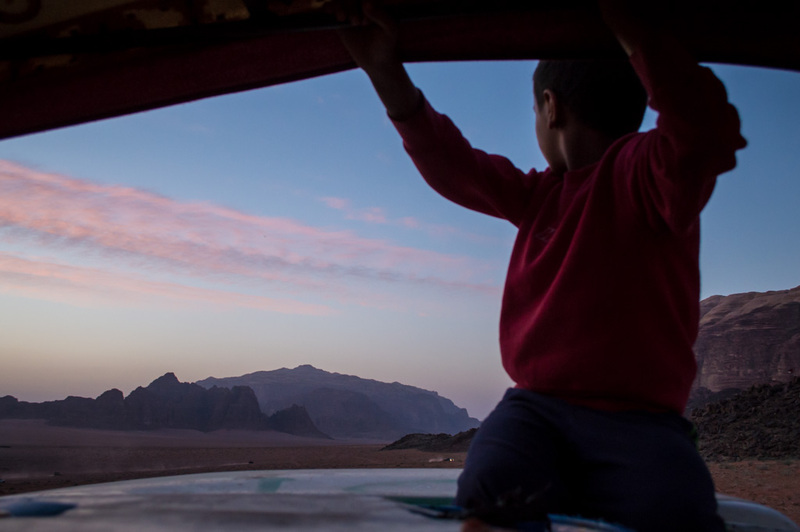 Once we made it past the gate and into the small village in the park (where the Zalabia, the Bedouin tribe of that area, live), we got out of our van and jumped into the bed of a sweet safari-like Jeep. Most of our time was spent in that Jeep, cruising through sand dunes and checking out sweet rock formations, taking pictures, and overall just in awe of the vastness of the desert and the beauty around us. The breeze on the Jeep and the shade from our little canopy on the bed also helped keep us happy. We climbed up some huge rocks to a patch of green around a natural spring, where we enjoyed the view and one of our team members took a water sample for her research project. We then had lunch and a little time to rest at our campsite at the foot of one of the giant rock formations. I took the chance any free moment I got to keep reading Seven Pillars of Wisdom, which I have thoroughly enjoyed so far. We toured some more, watched the sunset on top of another rock formation, and made it back to the campsite for dinner. Descending from our little spring in the desert. I feel like “rock formation” doesn’t do these giants justice. When I say they were giant, I really do mean massive, steep, rock mountains jutting out of the otherwise soft desert floor. Getting ready for the sunset. A couple of friends and I spent much of the night lying out under the stars, telling stories and our favorite ancient myths and epics. That’s what you do when you’re all a bunch of history geeks on a weekend get-away. 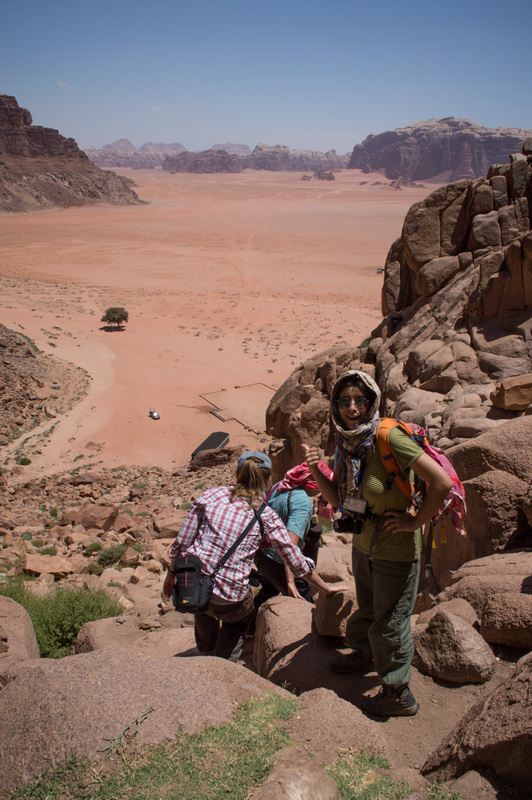 The next day we did a lot of hiking and exploring with one of our really cool Bedouin guides. We were exhausted by the end of it all and were happy to eventually make it back to our van. As soon as we got home I collapsed on my bed and was out for the rest of the night. Our campsite during the peaceful hours of the morning.